I think it's pretty clear how big a fan I am of simplifying everything in my life. It's definitely more than just decluttering my house. I'm hoping to have a guide to simplifying something in your life every month, we shall see. But at least I have one for you this month: meal prep and meal planning. Since I decided to eat totally clean as my health goal of January, I've spent a lot of time in the kitchen. But not nearly as much as I thought I was going to have to, thanks in part to smart and simple prep and planning. Hopefully the tricks I use will help you too. Simplifying your ingredients is the fastest and easiest way to simplify the entire meal planning and prep process. There's rarely a dish that I make that has more than 5 ingredients. We generally go the Food Nanny route - protein, starch, two vegetables. Pretty easy when you think of it that way: steak, baked potato, green beans, carrots; chicken, rice, broccoli, bell peppers. I never feel like those things need tons of seasonings or anything else, simple is better. In fact, we have made some dishes that had a lot of ingredients and we just didn't like it or didn't taste a difference from when we simplified the same recipe. Because I cook often enough and know what we like well enough, I can look at a longer ingredient list of a recipe and cross out things I know won't matter (like when Asian dishes call for green onion on the top, we both hate that so why bother?) And of course, I never make complicated dishes on a week night, that's just asking for trouble. Save that for the weekend! Frozen vegetables are flash frozen at the peak of their freshness, so they are just as nutritious for you, if not more so, as the fresh stuff in the produce section. And they do have organic produce in the frozen section, if that's important to you. You absolutely save money when you do everything yourself, like washing and chopping vegetables, making your own bread, etc., but you can find sales on the convenience version of these items. I do like to prep a lot of things from fresh on the weekends, but we always have frozen vegetables in our freezer to help simplify things on busy nights or in otherwise complicated recipes. If these items can help you avoid take out or pizza delivery, it's worth it! I can make one dish and eat it every day, I have no issues with leftovers. If you're like me, you've probably already simplified your meal planning. John, however, will not eat the same thing two days in a row, no matter how much he liked it the first time. But there's nothing simple about cooking a totally different meal for every single night of the week, it's too much work. So I plan ahead with the ingredients and see how I can cook things just once to use multiple times throughout the week. Sometimes this means that I just need to leave the leftovers in the fridge for a day and John will eat them later. Most of the time, I need to plan a different flavored dish. It's not as hard as it sounds - just think about how you can cook the ingredients that take you longer (meat, rice, whatever it is for you) just once and then change up the seasonings during the week to make it seem different. For example, on Monday I'll bake chicken, which I generally season and marinate on Sundays with just basic seasonings, and serve that with barbecue sauce, rice, broccoli, maybe rolls or something. Then on Tuesday, I'll take pieces of chicken and some of the leftover rice and mix that with vegetables and teriyaki sauce to make a stir fry (day old rice is better for stir fry, in case you didn't know), and John feels like it's a totally different dish even though he's technically eating leftovers. Plus, I saved myself the trouble of having to waste time cooking chicken and rice separately multiple times throughout the week, everyone wins. If I wanted to stretch it even further, I could make a chicken and dumpling soup later in the week. I have a small list of favorites but I plan on expanding it soon. If you make a favorite every other week, that's only twice a month. And trust me, John would eat pasta and meatballs twice a week if I made it that often. Favorites are favorites for a reason. 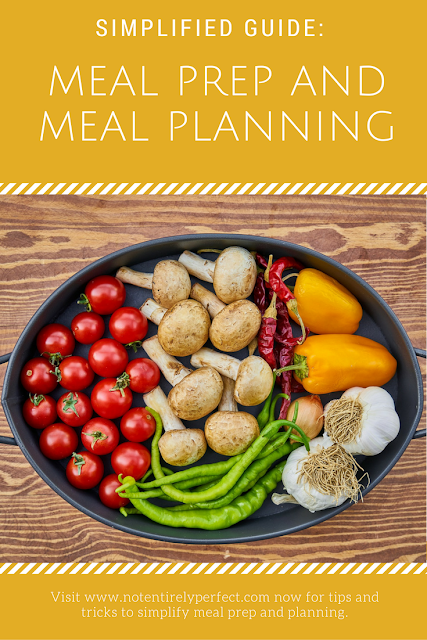 Meal planning is much simpler if you incorporate these dishes as often as possible - you know what to shop for, you know what you can keep on hand and reuse before it would go bad, and you can take advantage of sales. It's less stress on the cook too, not having to try something new every night. And you can make the favorites slightly different as well - in that stir fry example, I can always make it with beef strips instead if we wanted, but the basic ingredients would be the same, like the teriyaki sauce and spices. Working from this list also helps when it comes to cooking just once, because I can see which recipes use the same base ingredients and try to plan those for the same week. We grocery shop once a week (Sundays) and I prep it as soon as I get home. Now, I don't hate grocery shopping like some people, so I'm not burnt out when I get home. If you are, send someone else to do the shopping part or have it delivered. But once all the groceries are unloaded onto the kitchen counters, I prep everything before it touches the fridge and it helps so much. I wash and chop any fresh produce. I separate out the meat based on which dish it's for and when, and I season and marinate it either to be placed in the fridge or frozen. Basically, nothing hits our storage area until it's in a state ready to be cooked. It seems like more work up front, but it goes by quickly when you're in that 'prep everything' mindset and already have all the dishes and things out, and it's more than worth it when you go to cook something during the week and it's ready to go straight into the pan/oven/slow cooker. And you only have to wash your knives and things once! If you're stressed out by breakfasts and lunches, this would be the time to prep those as well. Make things that can go straight into the freezer, like breakfast burritos, which you can defrost each morning. That's about all I need to do to keep things simple in our kitchen. I would say I spend less than 30 minutes grocery shopping, an hour or two after that prepping things (depends on how many things we're making for the week), and no more than 15 minutes each night getting the dishes together, or morning if it's a slow cooker recipe. How much time do you spend in the kitchen each week? How do you simplify things for yourself?